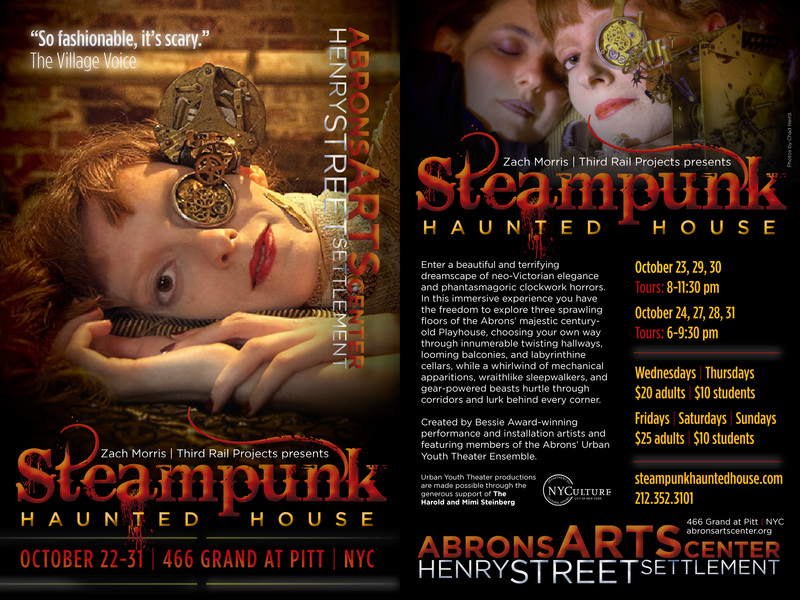 In this truly immersive experience, audience members are thrust into a beautiful and terrifying dreamscape of neo-Victorian elegance and phantasmagoric clockwork horrors. Once inside, audience members are separated, until one by one, they find themselves alone, lost somewhere within the three sprawling floors of Abrons’ majestic century-old playhouse. From there, they must choose where to go, exploring innumerable twisting hallways, looming balconies, and labyrinthine cellars. All the while, a whirlwind of mechanical apparitions, wraithlike sleepwalkers, and gear-powered beasts hurtle through corridors and lurk behind every corner and within every room. The Dream Engine is visible from several parts of the haunted house. It serves to anchor the visitor experience and provide a visual throughline within a self-guided narrative. In contrast to the dim, warm glow of most of the environments in the house, the Dream Engine emits a shocking blue-white light. This light is visible throughout the house, emitting from portholes, cracks and from around corners, foreshadowing the climactic tableau that concludes the evening.